You jam as much as you can into your daily routine which leaves you feeling tired and exhausted. You reach for the coke, energy bar or coffee to help give you that edge to get through the day. Although these options leave you feeling great for a short period of time because they stimulate adrenaline or spike your blood sugar levels, after a while, you crash and that quick energy hit leaves you feeling even more exhausted than you did to start with. 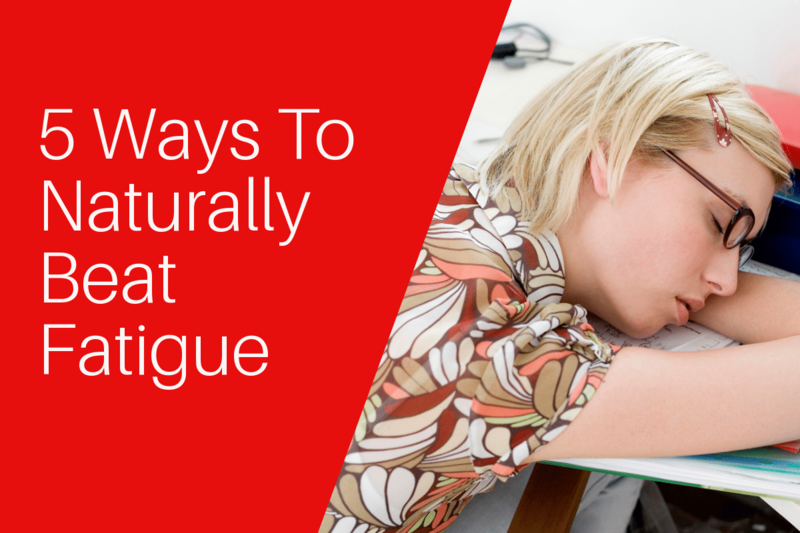 There are other ways to beat that fatigue. Here are 5 ways you can naturally increase your energy. Skipping meals can leave you feeling irritated, sluggish, unable to concentrate and also mess with your metabolism. Restricting your diet can also result in a lack of essential nutrients such as iron, B vitamin’s, magnesium and zinc which can negatively affect your energy levels. Make the time to eat regular meals away from your desk. Your diet should be rich in fruits, vegetables, lean protein, seeds, whole grains (if you can tolerate them) and good fats such as nuts, avocado, and olive oil. When you choose to eat a fresh whole food diet it will also give you plenty of nutrients needed for sustained energy throughout the day. Making time to move can seem very challenging at times, however, it can be a great way to increase your energy levels. Incorporating exercise into your daily routine will help increase blood flow. Allowing more blood and oxygen to move around the body providing you with energy. If you don’t like structured exercise like a gym class or program choose something that is fun such as dancing, rock climbing or playing a sport with friends. You can also include incidental exercise into your day by taking the stairs instead of the lift or park further away from the office or shops. Are you feeling tired because you are running on 5 hours sleep a night? We need at least 7-8 hours of restful sleep a night to function properly. Life and kids throw you curve balls and I totally understand that getting restful sleep doesn’t always happen! Aim to go to bed before 10 pm every night and wake up at the same time every day, even on weekends. Your circadian rhythm works best when you have regular sleep habits. If you are struggling to fall asleep try some meditation or mindfulness to calm your mind and avoid using screens before bed. 2 pm hits and you are searching for the coffee or the sweet treats because you want a quick energy boost. It leaves you feeling great for a short period of time, then you crash. Swap the coffee, energy drink, fruit juice, soft drink, processed food high in sugar such as biscuits and chocolate and switch to fresh whole food such as a banana, apple, boiled egg or a handful of nuts to help boost your energy and reduce fatigue. Fatigue can be one of the first signs of your body telling you its dehydrated. You don’t need any of these fancy sports drinks, just water. Make a conscious effort to drink more because you may not always feel thirsty. Have a glass of water on your desk or carry a water bottle with you. If you are really active or live in a hot humid environment, you may need to drink a little more. Aim for a minimum of 1.5L of water a day. Many people feel tired and exhausted on a daily basis. However eating a fresh whole food diet, drinking enough water, getting plenty of sleep and moving your body are simple ways to improve your energy levels. Become part of our supportive community at Empowering Ambitious Women! Sign up for regular content on our dedicated website, Facebook and Instagram accounts.